It’s the best of all possible worlds – lettuce with a fresh crunch, but the flavor of the grill. That’s what you get when you grill romaine, a lettuce that is just the right mixture of sturdy and leafy to withstand searing heat. 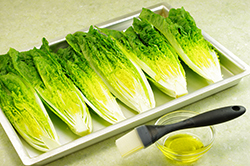 Make sure you cut, rinse, and dry the romaine at least 30 minutes for optimum grill marks and crispness. If too much moisture is in the leaves, the lettuce will steam and wilt. 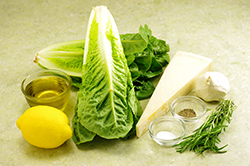 Set a double layer of kitchen towels on the counter and lay lettuce-cut-side down to drain. Use another dry towel to pat moisture off the top. Brush the cut side of the romaine halves with olive oil and season with salt and pepper. Grill on the cut sides only until the leaves are browned and sizzled on the outside edges and the lettuce has great caramelized grill marks, 3 to 4 minutes total. Place the halves on a platter or on 4 individual plates. Spoon the dressing over the cut sides and shave some cheese on top for a delicious garnish. Serve at once. Change the flavors of dressing to make this a classic Caesar with bottled Caesar dressing, or serve bacon, tomatoes, and avocado on the side and spoon Creamy Blue Cheese dressing over the top. Looser than a paste, this is a wonderfully aromatic basting sauce or drizzle to use on garden vegetables, beef, pork, chicken, or leg of lamb before, during, and after grilling. 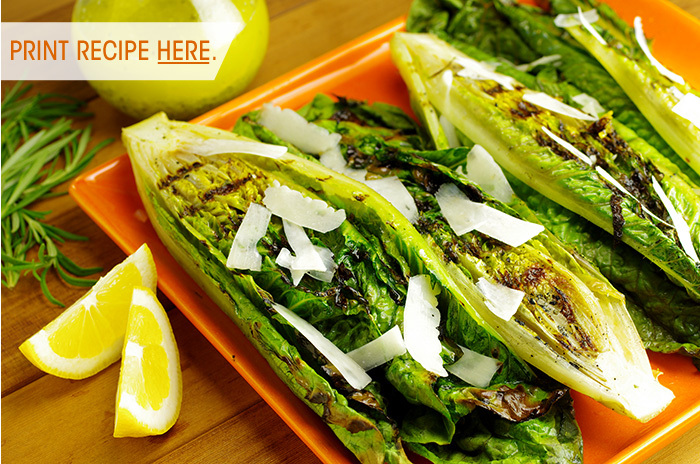 Try it on High-Heat Grilled Romaine Salad (above). You’ll also love this brushed on bread or pizza dough. Make extra to drizzle over grilled asparagus, greens, tomatoes, and more. For the best texture, use a mortar and pestle. You also may use a food processor. If using a mortar and pestle, combine the rosemary, salt, and garlic in the mortar and grind into a fine paste with the pestle. Drizzle in the olive oil and grind again. 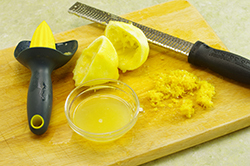 Add the lemon zest and juice, grind, and taste. Add more salt, if desired, and season with pepper. 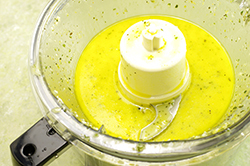 Alternatively, combine the rosemary, salt, and garlic in a food processor and pulse just to chop into a paste. Add the olive oil and pulse again. Add the lemon zest and juice and pulse, then season with salt and pepper as needed. The baste will keep in the refrigerator for up to 1 week.